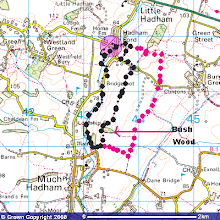 Earlier this week, Wendy and I set off to walk the entire Little Hadham Parish boundary. In places there is no footpath actually on the the boundary, but we were never too far away. 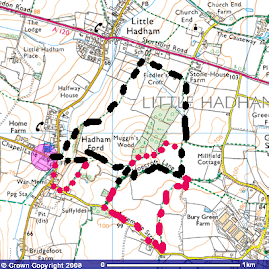 In total, the walk was just over 11 miles and the plan was to record all forms of the local natural history as we went. Consequently, we took the whole day to cover the distance, beginning at Tesco, Bishop's Stortford, just 800 yards from the boundary at 8.20 and returning to the car at 4.00pm. In all, we recorded 44 bird species, 11 butterfly species, several moths, 3 dragon/damselfly species and numerous flowering plants including bee orchid and pyramidal orchid. All along the route there were pleasing stands of wild flowers, such as these poppies and thistles on a field margin. Black and yellow longhorn beetle, Rutpela maculata. 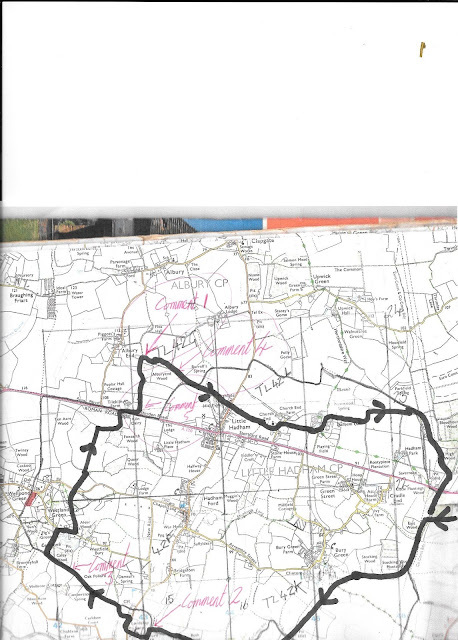 Route in thick black line, parish boundary in thin pencil line. Comments refer Countryside Access Officer, Mr. Maddex, to parts of the route that require cutting back, which will be done in the coming weeks. Worst place were over the River Ash at Comment 2 and Comment 5 where we had to knock back the encroaching nettles. A primary school teacher for 30 years, I retired from teaching in July 2009 to set up my own science enhancement and communication company. The Primary Works offers science clubs, workshops and staged science shows nationwide. I have always been interested in bird watching since my early years. Apparently my first tick was after inquiring about a chaffinch and then receiving the Observer book of birds. By the age of 9 I had moved on to Tory Peterson's collins guide and was now involved on YOC birding holidays to Northumbria, Essex coast, Slimbridge and Yorkshire. My twitching rule is that I will willingly travel 1km for each gram the bird weighs. However, I have had many rarities just by being in the right place. I have travelled widely throughout Europe and also visited Australia and Sri Lanka. In 2016 I spent time at Portland Bird Obs and two trips to Aviero, Portugal. 2017 found me back in Sri Lanka in Feb/March, then July and back for New Year's Eve celebrations in December. Also returned to The Camargue in May for a 4 day trip. Few plans for 2018, but nothing yet booked apart from a trip to the IOW. Note the stripes, denoting a bird fledged this year. The following are some useful websites that may interest readers of this blog. http://www.hertsbirdclub.org.uk/ The official herts bird club website. Frequently updated, listing bird sightings around the county. Offers links to many other websites. Both of these sites also offer links to yahoo discussion groups. http://www.birdforum.net/ An international site. You can enter as a guest but become a member( free) to post comments, bird sightings and just about anything to do with wild birds. Good news updates, classified section for binoculars, cameras etc. http://www.guidedbirdwatching.com/ A new site set up where you can contact people worldwide who will help you find good birds in their country. UK section being set up presently. Fellow birders blog. Strtford resident, Graeme Smith regulary birds the area south of Stortford as well as around Spellbrook and the River Stort from Spellbrook to Twyford Locks. Some superb bird photography: Graeme uses a digital camera attached to his powerful telescope to get detailled images of the birds he sees. Well worth a browse. Moth mayhem with a new County record. 10.03.15 Letchworth NHS. Illustrated talk on The Natural History of an East Herts parish. 30.06.15: Broxbourne RSPB Group: Illustrated talk on The Birds of Southern Sri Lanka. 09.02.16 Shoreham District Ornithological Society: Illustrated talk on Bird Reserves of Kent. 08.02.17: South Leicester Bird Club: Illustrated talk on Bird Reserves of Kent. Dioryctria sylvestrella (23.09.15) New for Herts!! silverweed (Potentilla anserina) 90 sp.